1. 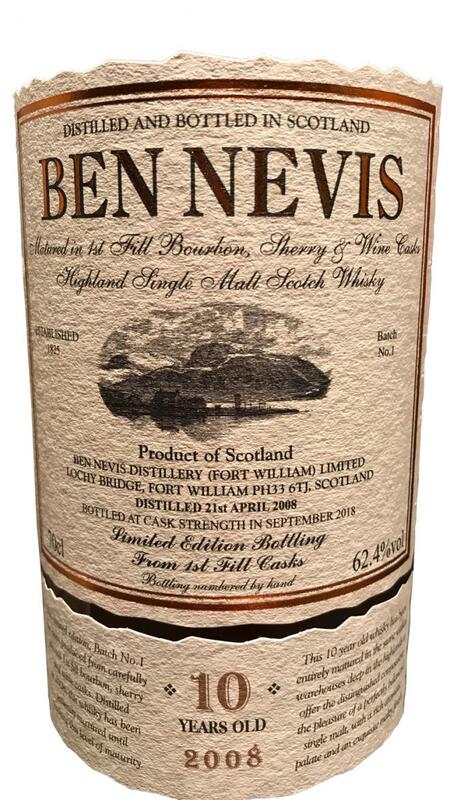 The Ben Nevis 10yo (46%) is currently difficult to obtain. Will it no longer be produced? Colin Ross: We ran out of whisky in our warehouse to continue with the sales of Ben Nevis 10 Years Old towards the end of 2017. The unprecedented demand for this expression, combined with an instruction from our parent company to cut back on what spirit we were laying down in our own name caused this problem. In October of 2017 my son and I visited our parent company in Japan and informed them of the situation and advised that a major competitor had considerable stocks that they were prepared to sell but as we did not have the necessary funding we had hoped that we could borrow from them but to be told that they were not prepared to lend us the money. However, they were prepared to purchase these stocks to be held own their name. We expected this to be fine thinking that we could buy back from them as and when required. This proved not to be the case as when we ran out of stock in March or April of last year they did not offer to sell us any of their Ben Nevis stock., so we had no alternative but to promote our MacDonald’s Traditional and 12 Years Old Nevis Dew instead. As we were aware of the stocks all matured in fresh dumped bourbon, sherry and wine casks we decided to vat these and sell as Batch No.1 but we were unable to get this to market until just before Christmas. As we had no available stock in refill casks to make a similar vattiing to our normal 10 Years Old we had to sell this as a different product and unfortunately at a higher price. We do have some stock with our bottlers at present so hopefully in the not too distant future we shall be able to bring our normal 10 years old malt back onto the market. 2. 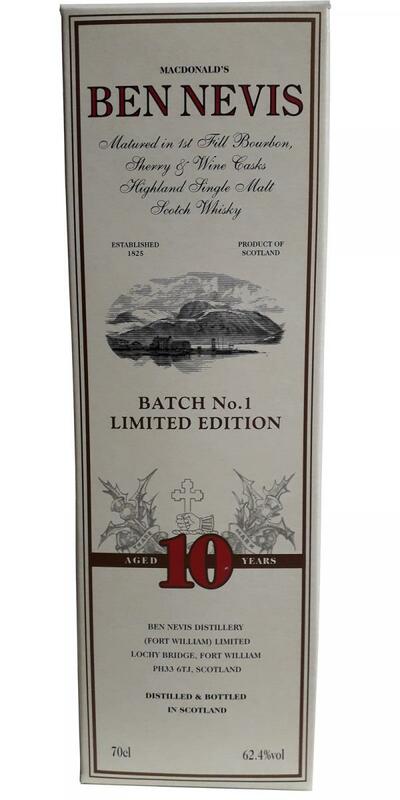 Is the 10yo Batch 1 (62.4%) intended as a replacement for the 10yo (46%) or as a supplement? Colin Ross: Batch No.1 is not intended as a replacement for the 10years old, more, as you say, as a supplement. 3. How many bottles of Batch 1 were produced? Colin Ross: We are not sure as to how many bottles of Batch No.1 will be released as we did not have sufficient empty bottles in stock to bottle the entire quantity and are awaiting further stocks of glass to complete the entire bottling of this batch but it does look as though we may have somewhere between 8 and 9 thousand bottles. 4. Will there be a batch 2 and if yes, when? Colin Ross: At present we have no further plans to release a Batch No.2 but if something nice comes up then Batch No.2 would then be worth considering. 5. Is it rumored that the Ben Nevis Distillery will be closed soon? Colin Ross: We were quite shocked to learn of this rumour. Apparently it stems from somebody speaking with another distillery company who a number of years ago expressed a possible interest in buying Ben Nevis Distillery, who on investigation discovered that the ground on which our distillery is built belongs to the aluminium smelter company neighbouring the distillery. The lease is a 99 years lease which dates from 1950 therefore we still have another 30 years to run with the current lease and at the moment our parent company are in negotiations with the land owners with regards to extending this lease into the future . I think that the current loss of our 10 years old also contributed to the rumour. 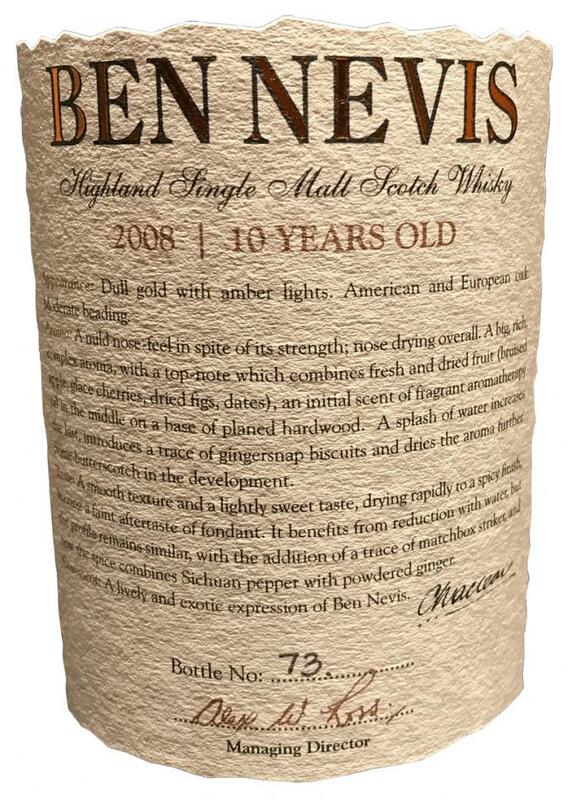 I, personally, would be very disappointed if Ben Nevis distillery were to cease trading after 30 years of working under our Japanese owners in an effort to re-establish Ben Nevis as a whisky of quality, and prior to that being responsible for getting the distillery back into production in 1984 when owned by Long John International. Ben Nevis is very close to my heart with having been employed here for 34 years of my 54 years of working in production in the Scotch Whisky business. Hopefully Ben Nevis will continue to be located here and producing a fine whisky for many years to come otherwise these past 30 years will have been a total waste of my time and the greater part of my working life. Many thanks you to Colin Ross for his informative and helpful answers! From the standard 10-year-old, it differs mainly by more volume and depth, and the fruit is more emphasized here, which is probably due to the wine barrels used. A gain, he is quite sure, even if he significantly exceeds the pain threshold for a ten-year whisky. No overly complex whisky, but it miraculously reflects the rugged and never-soft charm of the distillery character that makes Ben Nevis stand out from other Highland distilleries. It is to be hoped that the rumors about a closure of the distillery in the air and we can count on more batches. Gorgeous rugged and absolutely typical Ben Nevis it starts immediately. Rusty nails and deep dark oily cocoa powder bring the unmistakable character of this distillery, which I miss so many times in many independent bottlings. In addition, a nice sweet honey and malt notes and a lot of Muscovado sugar, ripe pears, cherries and mirabelle plums provide for an initially rather slight Fruchtaromatik, which is replaced after a while but of raisins, dried apricots and roasted hazelnuts and always spicy. The various barrels occur primarily through tart and dry spices such as cardamom and nutmeg in appearance. Despite the more than 60% of the alcohol is barely perceptible. Warm and peppery-spicy it starts in the mouth, everything is flooded with a thick heavy sweetness that reminds of spicy acacia honey and brown cane sugar. And here again dark dark chocolate in combination with prunes and raisins. Scruffy leather, harsh espresso beans, grated nutmeg and cardamom, along with harsh oak flavors, provide a lot of tart dryness, which counteracts the very domninante sweetness wonderfully. With extremely voluminous force this everything is presented, supported by the edgy alcohol. If I had estimated this Ben Nevis due to the spiciness and full aroma, the rather short finish brings the youthfulness to light. But even here it can convince with beautiful spicy honey and dark vinous fruit flavors and slightly tart oak wood provides for a dry becoming finale, which still hangs a delicate and barely perceptible plume of smoke. 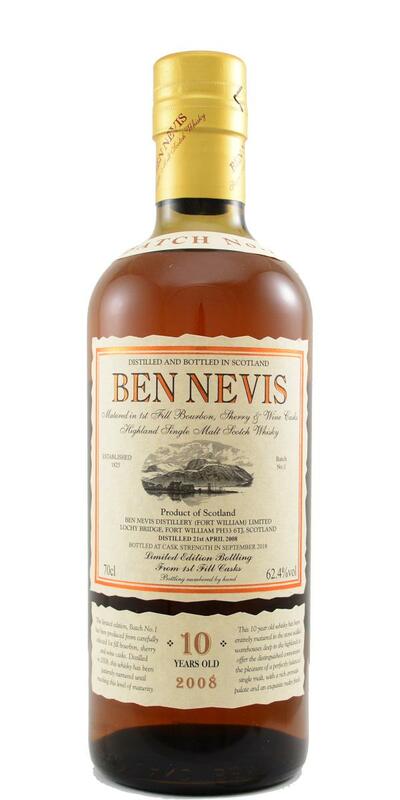 An absolutely typical Ben Nevis, reminiscent of the 10-year-old standard bottling, but much more voluminous, multi-layered, and complex, with rich fruit and flower aromas, raisins and figs, notes of earth and leather, wet stone, bittersweet chocolate, caramel pudding, Macadamia and nutmeg, old leather and moist wood, and a powerful, markedly salty coastal touch. The whisky works - like the standard filling - much older and more mature than the age suggests. Even the first nose is overwhelmed, but the more time you give it and treat it to water, the more clearly the individual components emerge. In swallowing, he unfolds once again a mighty boost, which slowly, but really only very slowly ebbs. This whisky is not a drink, but an experience, a fluid journey exactly where it comes from: in the rugged, yet harmonious tension of mountains and sea. Just great! The Limited Edition shows in the nose a lot more of Kabapulver and Nougat together with the tree resin and the spices / herbs than the previously tasted "normal" 10 (WID: 113652). Intensive and voluminous. So imagine Ben Nevis in my nose. In the mouth then at first pretty creamy and just these notes. But then something bothers me. This is probably the wine that comes through a bit too strong for my taste and does not seem so well integrated. The mouthfeel also develops towards wine. I like the nose awesome. The taste and finish bothers me something this "vinous" impact. That makes him a bit inharmonious for me. Certainly still a good malt. The nose promises more. Tried this one H2H with the standard 10yo. This CS is much more intense, more chocolate and coffee, more spicy. The standard one has more fruits, peach. Actually, because of the use of different kind of casks ánd CS vs. 46% makes it completely different whisky's. These two are often compared by it's price, the CS being more than twice as expensive, but with these different kind of whisky's it's not really fair to compare. Spicy and fruity, curry, pepper, prunes, chocolate, coffee, intense nose. Still intense, powerfull, pepper, caramel, coffee, very full. Spicy, chocolate, also some honey sweetness, and somewhat of peach. Still very powerfull, spicy, pepper. Very long finish, coffee, chocolate. C: The standard 10yo, amplified. This means more blatant action, so eking out the subtleties may require more effort/time – not ideal in a festival environment. I always wondered why people were buying a 10 year old whisky for such a high price. Then I tried it and damn, I get it now. I still think it's too expensive but it is a superb dram!